Many of today’s maladies like asthma, allergies, eczema, autism, thyroid problems, and autoimmune disease are caused by leaky gut. Yet most medical doctors are baffled by it. This is why many people have learned they have to be their own Sherlock Holmes and take responsibility for their own health. Over the past few weeks, I’ve written about how what we eat affects our health. 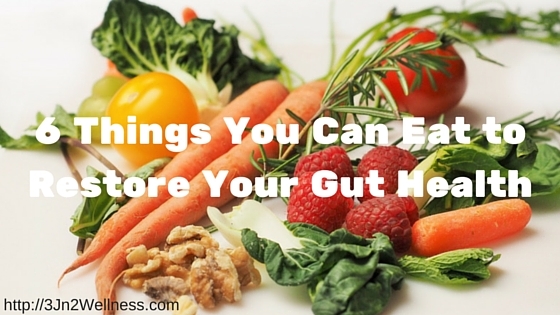 Today, we’re going to talk about 6 things you can eat to restore your gut health. The number one way to restore your gut is to change what you eat. You must allow your digestive system to rest. Food doesn’t restore health to the body, the body does that itself, which is how God designed it. Give your body the building blocks it needs to repair itself. Eat foods that are easy to digest. Bone broth has enjoyed a surge in popularity in the United States recently, but it’s nothing new. Many cultures have used all parts of an animal as food for millennia. Stocks and broths are the foundations of many types of cooking. The terms broth, bone broth, and stock are used interchangeably by many(2). They have the same ingredients: water, meat or bones (or both), vegetables, and seasonings. 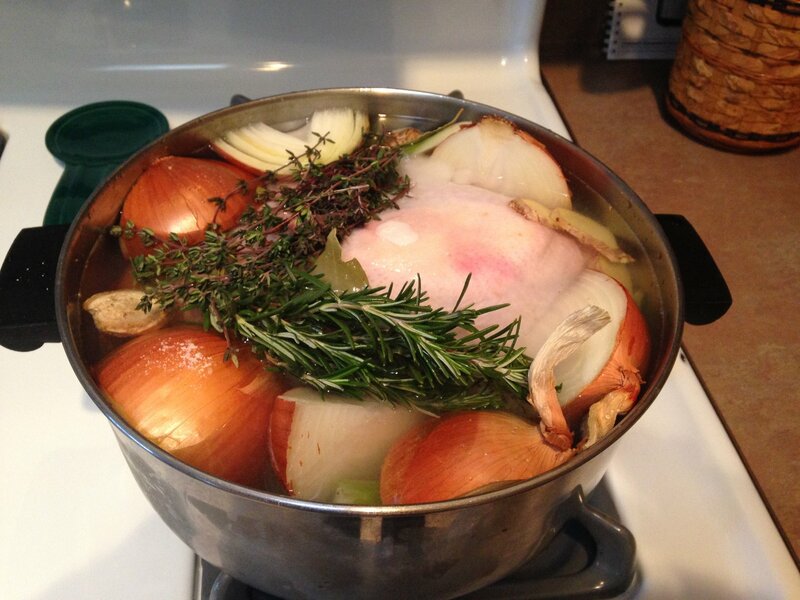 Bone broth is made with bones, but may contain a small amount of meat adhering to the bones. Bone broth is rich in protein, minerals, collagen, and vitamins. I recommend consuming one cup of bone broth daily. My recipe is here. Eat 1 cup of cultured dairy products per day, like goat’s milk or coconut milk kefir, amasai (from A2 cows (3)), and sheep-milk yogurt that are rich in probiotics. Here is my recipe for Coconut Milk Kefir. It’s very easy to make. I add it to my Super Restoring Smoothie. 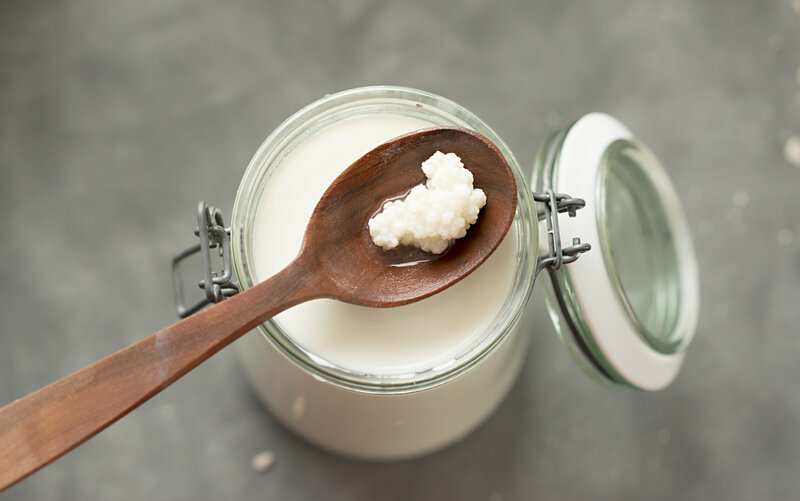 If you are lactose intolerant, you may be able to consume kefir, amasi, or a very strong yogurt because probiotics actually help break down lactose within the body and can also help people overcome gluten intolerance and Celiac disease. Take 50-100 billion units daily of a probiotic supplement. Probiotics can help re-colonize the gut with healthy bacteria. Long term, this is the most important supplement anyone can take. If you’re eating a large amount of probiotic rich foods every day (like sauerkraut, kavas, and coconut kefir), then you don’t need to, but most people do. Cultured or fermented foods have a very long history in virtually all native diets, and have always been highly prized for their health benefits. If you can’t handle fermented milk products (above), try these fermented vegetables. 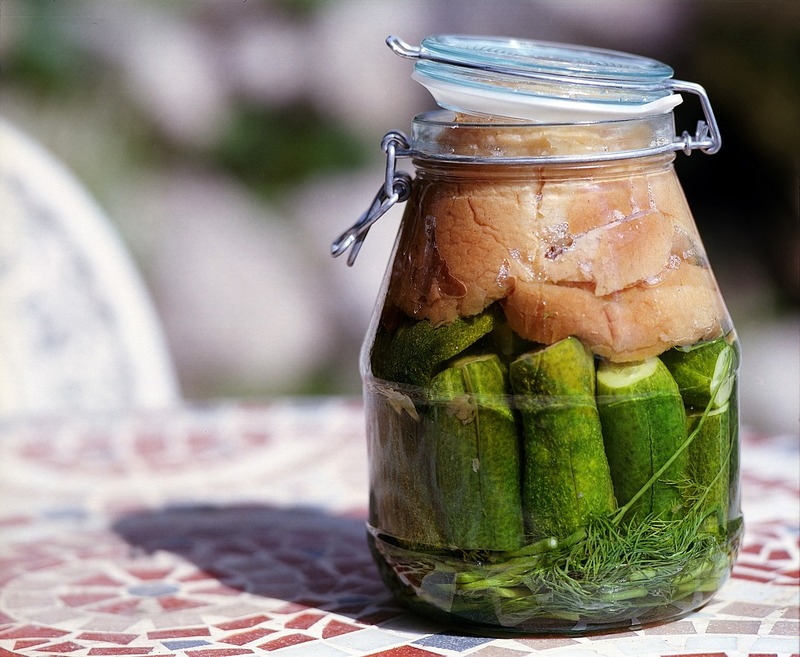 Fermenting foods helps balance the good bacteria that live in your gut against the disease-causing bacteria. Even if you eat fermented milk products, eating fermented veggies will help balance your intestinal flora, thereby boosting overall immunity. Learn how to ferment here. All the food we eat to help restore the gut to health should be easy to digest. “Some produce is most nutritious uncooked while other kinds need heat to bring out the best in them,” says Dawn Jackson Blatner, RD, a registered dietitian with a practice in Chicago. 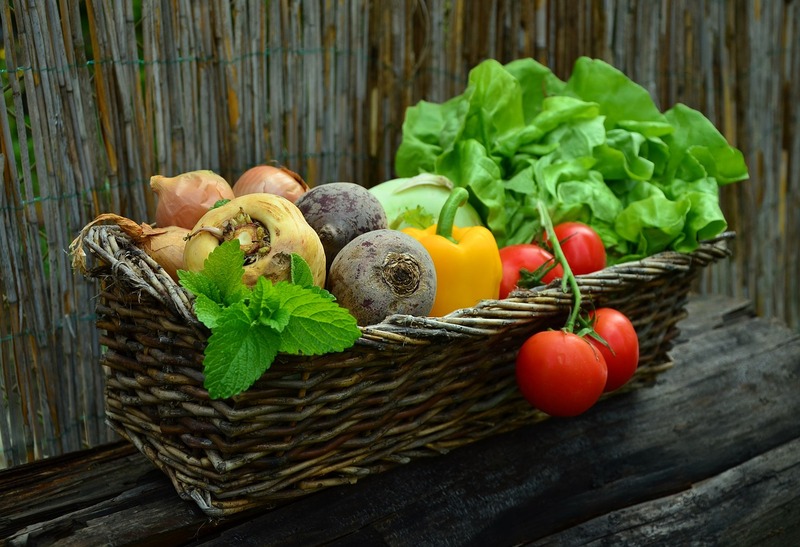 The reason that raw vegetables can be hard on the intestines is their fiber content. Steaming vegetables helps break down the fibers, which makes them easier on the digestive system because they’re already partly broken down. 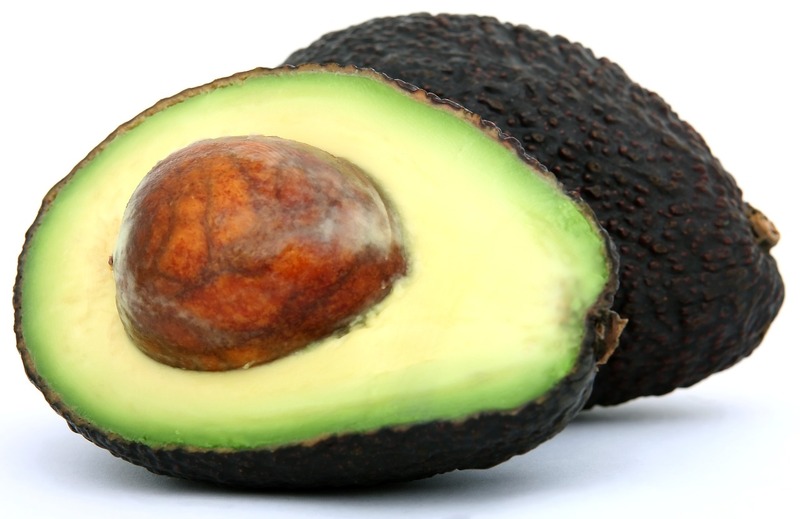 Contrary to popular opinion, consuming healthy fats in moderation is good for you! Foods like egg yolks, salmon, avocados, ghee, and coconut oil are easy on the gut and have many health benefits. 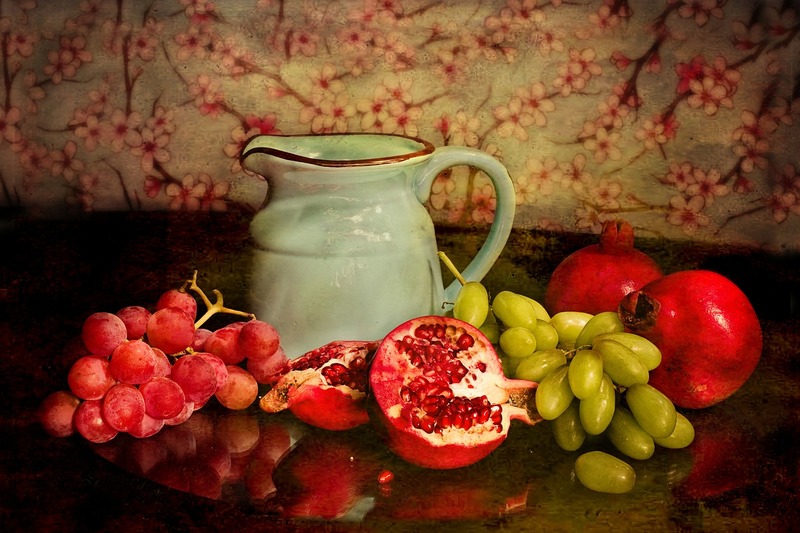 Consuming 1-2 servings of fruit daily is good on a leaky gut diet. You can steam apples and pears to make homemade applesauce or fruit sauce. Fruits, especially berries, are a good source of antioxidants, vitamins, and minerals. However, most people will need to exercise some portion control with fruits due to the high sugar content. Learn more in my new book, Be in Health: Bible-Based Health Restoration: Living in Harmony with God’s Ways Regarding Health. Available now. I’ve known for a long while that all of our immunity resides in the gut (actually learned this first about the dogs I raise!). And I’d get a good grade on both your to-eat and not-to-eat lists. The bone broth intrigues me. I’ve been hearing so much about it lately. Am going to give your recipe a try! Thank You. I hope you enjoy the bone broth, Susan. I just made a new batch yesterday. Great post, Carol. I am going to try the bone broth. I bought the organic whole chickens already. =) Thanks for sharing. Good for you, Sabrina! Let me know how you like it. We all decide what we can and can’t live with and proceed accordingly. Baby steps, girl! Fabulous post, Carol! Having had digestive issues most of my life, I know how challenging it is for doctors to make a diagnosis worth taking seriously. The onus is really on us to be our own detective, as you say. My life has really been a journey back to health and it happened exactly because of that. I’ve also been hearing a lot about bone broth lately and it makes me smile, as my mother just to make the most delicious beef broth, made from bones and meat, when I was young. Maybe I would be wise to revisit her recipe, or yours, and give my gut a little bit of extra tender loving care. Our poor guts get quite the workout, so, yes, being kind to them is advised. I love, love, love my bone broth! I’d heard of bone broth or better yet, chicken feet broth…with the same benefits as you mention and high on the collagen side. I have made this a few times in the past. 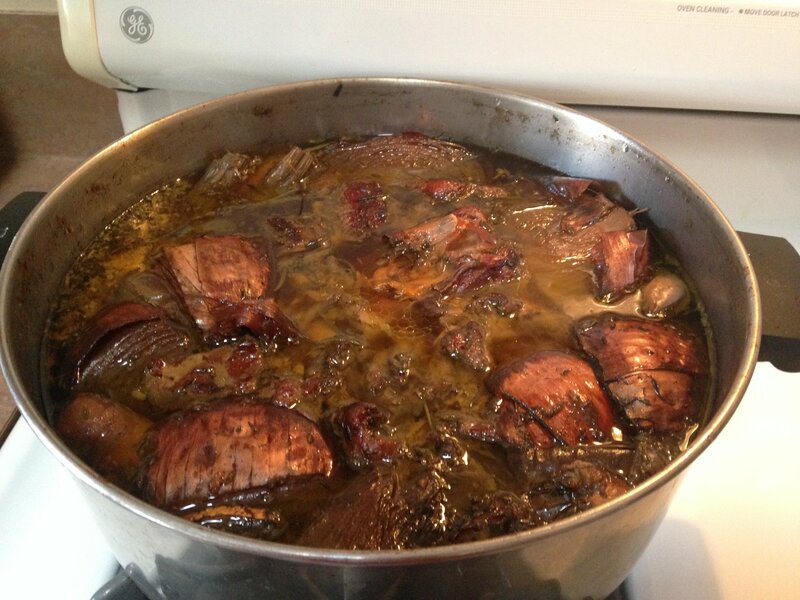 Since, I have done away with meat products and thus the broth. However, I want to add the collagen. I am thinking of making again..but do you have any other suggestions. Also do not consume dairy but coconut milk is a fav may have to try making that kefir. Thanks for this info. Bone broth is made from animal or fish bones. If you eat fish, you can use fish bones. Just be sure to use a non-oily fish like halibut or tilapia, rather than an oily fish like salmon. Also, cook your broth for only a couple of hours, because fish bones dissolve quickly. Here’s a recipe I found: http://drkellyann.com/paleo-recipes/2015/12/3/fish-bone-broth. Best wishes to you! This is a fabulous article on leaky gut. I am positive NSAID use was my biggest contributor to leaky gut, GERD and Barrett’s Esophagus. I have fixed my eating and lifestyle and no longer have GERD or BE. I am still working to get my gut to be completely healed. One thing, if someone has H.pylori fermented foods many not be the best things for them. So glad to hear you’re doing better, Karen. It’s a journey that many of us are taking. Thanks for the advice on H.pylori. There’s always an exception to everything, isn’t there? I don’t have any of the symptoms of leaky gut & the only thing I could eliminate is dairy, but I love cheese & yogurt. So, Im doing ok. Someday will make bone broth. Have seen it on the shelves but probably not as good. Almost seems like Jewish chicken soup which I do make. You’re so blessed to be healthy, Roz. May you continue to enjoy good health throughout your life! My gut is my biggest weak spot, and I’ve spent many years researching remedies, diet changes, and supplements. I take NSAIDs every day to manage inflammation and chronic pain…that combined with many abdominal surgeries and issues has left me with a fairly annoyed gut! My supplements definitely help. I can’t live without probiotics, herbs, and many of the foods you’ve listed. Fruits taste delicious, but I stay away from too many due to potential yeast issues and glycemic problems. We made kimchi ONCE, and it was a lot of work that resulted in not too many benefits, haha! We avoid dairy, but I can’t seem to stay away from cheese. You gave me some great options to consider and try, thank you! Sounds like you’ve been down a long road, Meghan, like I have. Glad you find the information helpful. What a very informative post! Learned a lot about how to keep my gut healthy! Thanks so much for sharing!! Love when I learn something new to help me stay healthy! You’re welcome, Joan. Glad you enjoyed it. 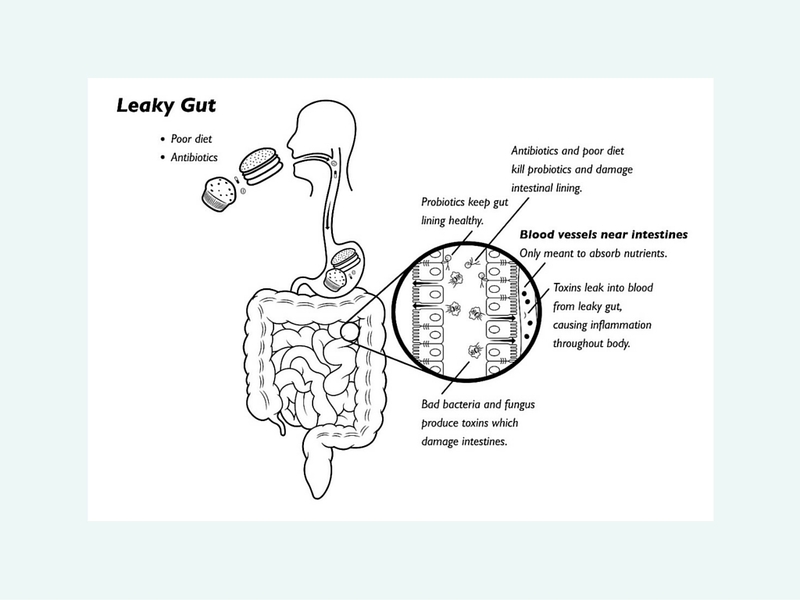 A very good article on leaky gut and the healthy food alternatives. I’m doing most of these, but I haven’t tried the bone broth as yet. Thanks for providing your recipe. That leaves me with no excuses not to try it. I’m glad you found the information useful, Joyce, and I hope you enjoy the bone broth! Was it Hippocrates who said ‘all disease begins in the gut’? So leaky gut is the root cause of many diseases that people struggle with today. Got and will be proactive. Yes, that Hippocrates was a smart guy. Hope you enjoyed the post. I love the analogy, Christy! It’s so true. My family history is big on autoimmune and gut issues. I don’t take any of the NSAIDs, and aim to follow a healthy diet. I know that food additives cause problems for me, and do pretty well with sticking to food with a short ingrediant list. Some of the other changes, I haven’t made yet. But I am very happy to see your recipe for bone broth and will be using that. It’s good to know what does and doesn’t work for you. Enjoy the bone broth! I’m pretty good on the vegetables, fruit, and good fats but have not tried bone broth before and I’m intrigued. I’m going to have to try your recipe. You’re so far ahead of a lot of people! Enjoy the bone broth! Thank you for the list of great foods. My late mother (who I swear was 1/2 swamp witch) used to make her own kefir. I can’t remember how many probiotics she determined were in her home-grown varieties, but she scoffed disdainfully at the stuff in the grocery stores – child’s play! I’ll bet your mom’s kefir was some powerful stuff! Do you have her recipe? Pickles and apples…and I had no idea they were good for leaky gut. Thanks for the tip! Yes, pickles, as long as they are fermented, and apples, as long as they are cooked, are good for leaky gut. Being vegan I can’t say I agree with your first 2 suggestions. Animal products are both acid and very hard to digest. I suffered from chronic IBS for years and there weren’t any doctors that could help me. It wasn’t until I switched to a totally vegan diet that all my problems disappeared. Keep up the fresh fruits and veggies a of course healthy fats. As I’m sure you know, Lisa, there are many conflicting opinions about vegetarianism. One can find as many pro “facts” as con “facts.” Since my beliefs and program are based on Old Testament dietary laws, meat is included. I’m glad that you found relief by eliminating meat, however, many people (including myself) will say that they found relief when they incorporated meat. You’re welcome, Katarina. It’s only recently that the medical community is taking notice of leaky gut. We need to restore our Gut health because it is important to spend the life happily and healthy. Ill-gotten treasures have no lasting value, but righteousness delivers from death.